Pretty complex, eh? All I needed to do was create some simple HTML. I point to a new CFM called preview and pass in the file name. Let’s take a look at preview.cfm. So what’s going on here? 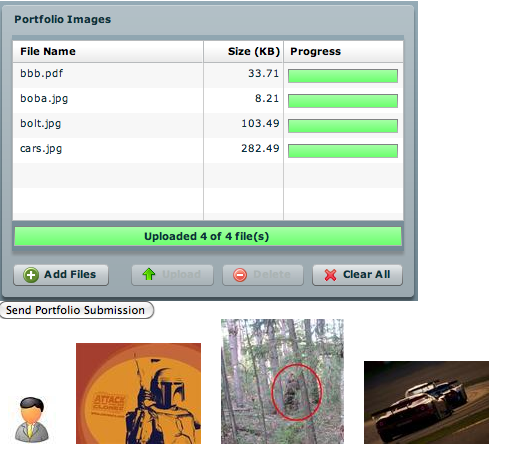 Remember that we use a special folder in the virtual file system for the user’s uploads. Because of this we can source a CFIMAGE to the file requested. We can also check to see if the file is a valid image. If it isn’t, we can use a default picture instead. The final thing we do is get the actual bits and serve it up via cfcontent. Here is a screen shot of the result. Notice that I could have made this look far nicer. Hopefully this makes sense and is useful!